Nell Painter during a visit to Wesleyan University in Middletown, Conn., in 2005. Three golden apples stoke the fantasies of boomer retirement: To write that bestseller. To earn an advanced degree. To disappear into an art studio and discover one’s inner Grandma Moses. In “Old in Art School,’’ Nell Painter manages to accomplish all three, starting at the tender age of 64, when she leaves a chaired professorship in history at Princeton and sets out on her second act. This feisty and delightfully irreverent memoir is a coming-of-age story for the over-60 set. Painter, author of the best-selling “The History of White People,’’ with a small armada of titles and honorifics under her belt, studied art as an undergraduate (and painted and drew essentially her entire life). 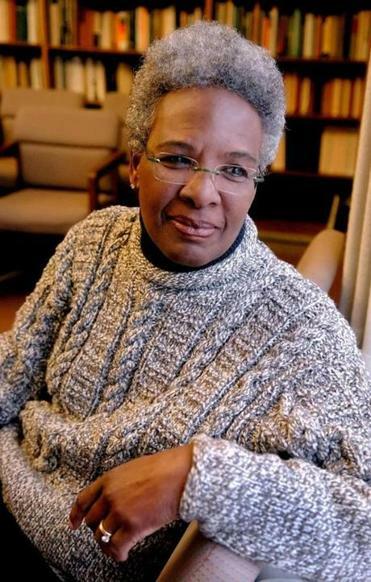 But for peripheral glances toward the iconography of African-American art in her scholarly historical work, she spent the next 30 years ensconced in the disciplines of research and deductive hypothesis, constructing meaningful narratives about real people. Her immersion in art school — first as a Rutgers undergrad, then as an MFA in painting at Rhode Island School of Design — is a rude awakening. What unfolds is partly a send-up of the art preparatory-patronage system in America and partly her own mock-heroic struggle to not just persevere but (spoiler alert) to triumph. The “older woman” in her must fend off the designation of dilettante. The woman of color, the often naked indifference to the contributions of black artists. But the really big story is about art, as it is made, judged, and promoted in studios that have the power to create or scuttle careers. Along the way, we are treated to wonderful digressions into the lives of 20th century artists. Many readers will learn from the historian’s contributions to this story, especially in the area of African-American art and the fate of figural and narrative work in an era when the merits of paintings are gauged by surface technique and material impact rather than by the ideas or values represented. Painter, the historian, runs headlong into this modern approach. The teacher in her is staggered by the lack of actual pedagogy that takes place in studio classes. The evaluator is shocked by the meaningless caprice of the famous “crits,” rituals in which students submit their work to peers and faculty for comment. Faculty (drawn from the Art World) are the critical gatekeepers of future careers. They are the ones who decide which students will receive special attention from visiting artists, which will be promoted to gallery owners, and which will get gallery representation. The reader will realize by now that Painter was not regarded as one of RISD’s next new things. “Art graduate school [is] an exercise in humiliation,” she writes. Egos are crushed; hopes are dashed; talent is so subjectively judged as to be almost meaningless. She heads to the Adirondacks where she and her husband summer, sets up an easel, and paints and prints to the point of exhaustion. When she is done, she has crossed her own Rubicon. She is finally able to see that she has grown as an artist, knows what she wants to do, and is no longer afraid of being dismissed. She completes her RISD thesis, but decamps to Harvard to receive an honorary degree the day an Art World god is due to review her work. One can’t help but cheer her on, both for her award and for her moxie. After graduating, she is awarded an artist’s residency in Newark, her hometown. Then she is off to Yale Art School for another residency, then a Fulbright, and in rapid succession, a stay at Yaddo. Not too shabby for a now 70-year-old who was told time and again that she had no idea how to paint. Painter went to art school to learn to paint her intellectual women friends. The most impressive portrait that she achieves here is her own — an unstoppable force tethered to an iron will.